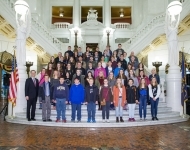 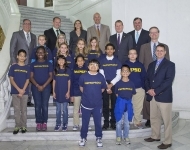 October 25, 2017 – Senator Hutchinson, along with other House and Senate members, met students from the Western Pennsylvania School for the Deaf during their annual day on the hill. 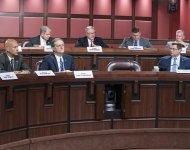 October 19, 2017 – Senator Hutchinson listens to testimony at a Senate Veterans’ Affairs and Emergency Preparedness Committee regarding Pennsylvania’s FirstNet system. 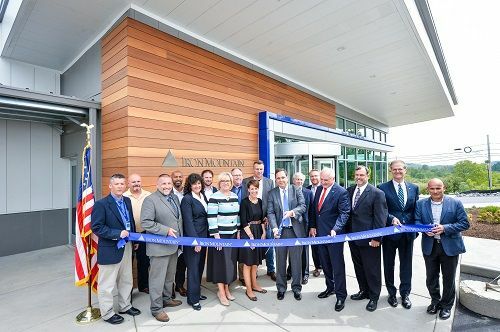 August 29, 2017 - Recently I had the pleasure of joining Congressman Mike Kelly, state Representative Tedd Nesbit and Butler County Commissioners Kevin Boozel, Kim Geyer and Leslie Osche at a ribbon cutting ceremony for Iron Mountain’s new $4.5 million, 11,600 square-foot customer welcome center at its Boyers facility in Butler County. 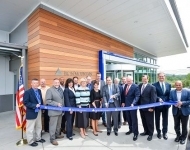 Iron Mountain's continued investment in the Boyers Underground is important for the many employees of the facility and the communities they call home. 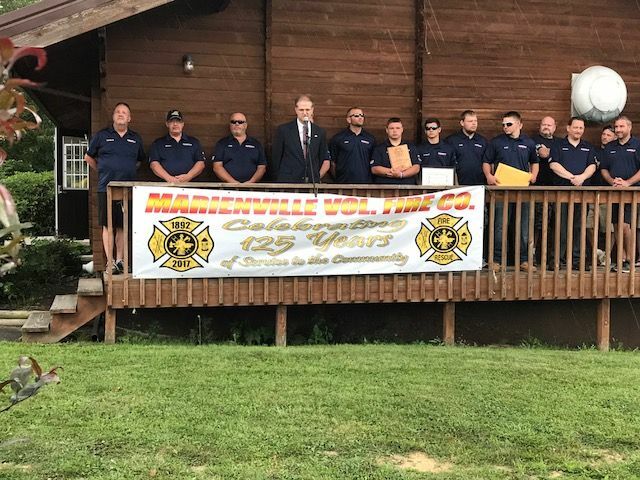 August 19, 2017 - I was pleased to help Marienville Volunteer Fire Company celebrate its 125th anniversary. 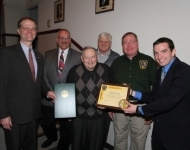 The proud history and vital role the Marienville Fire Company holds in the community are a tribute to its leaders and members who have carried it to its present heights. 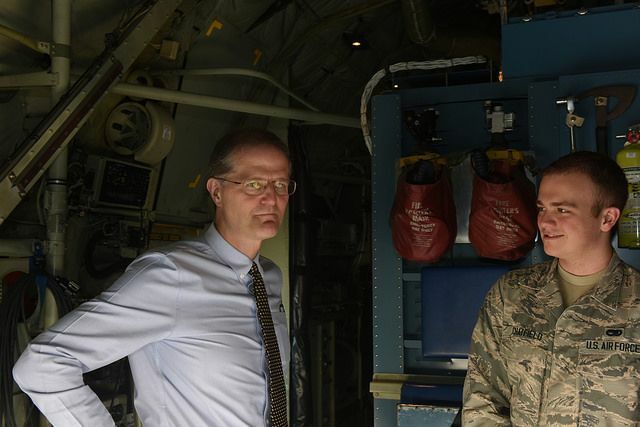 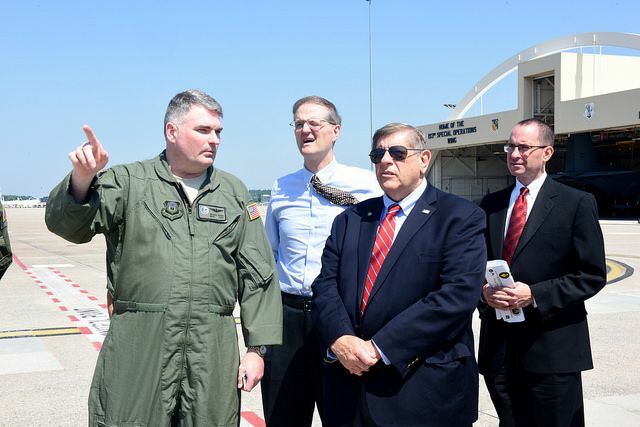 June 12, 2017 - Senator Hutchinson joined Senator Vulakovich for a tour of the 193rd Special Operations Wing in Middletown, PA. 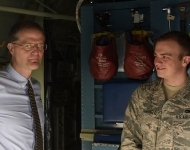 The 193rd maintains the only airborne psychological operations broadcasting platform for the entire U.S. military. 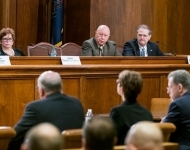 May 24, 2017 – Senator Hutchinson attended a joint Senate Majority Policy Committee and Senate Environmental Resources and Energy Committee to receive testimony from the Marcellus Shale Coalition, Calpine and Panda Power Funds. 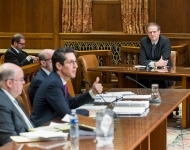 The testifiers also provided an update on the Marcellus Shale industry in Pennsylvania as well as trends they are seeing across the country. 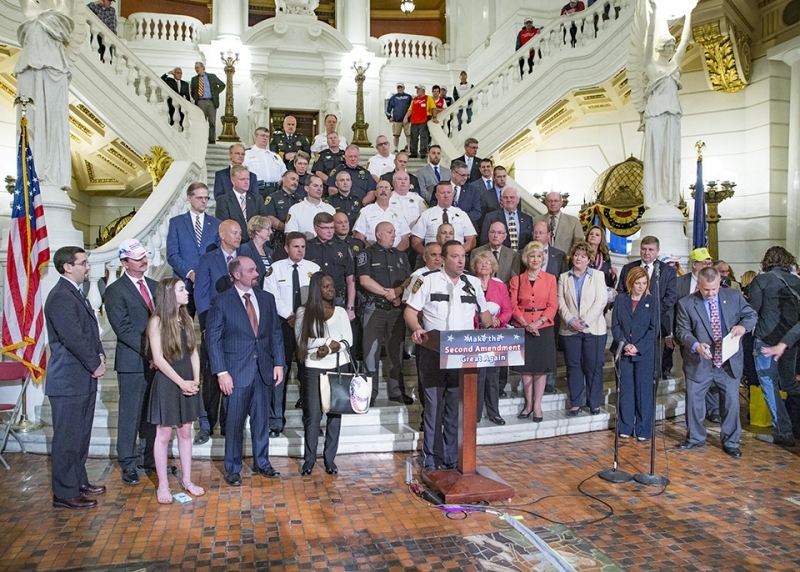 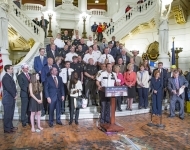 May 22, 2017 – Senator Hutchinson joined with hundreds of citizens and constituents and numerous lawmakers during a 2nd Amendment rally at the Capitol. 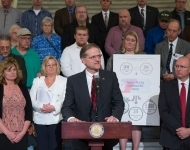 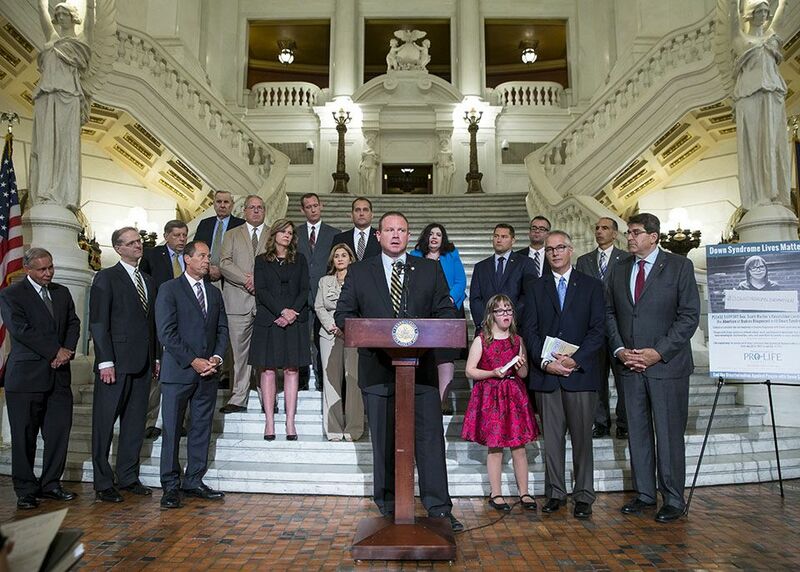 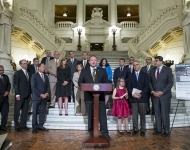 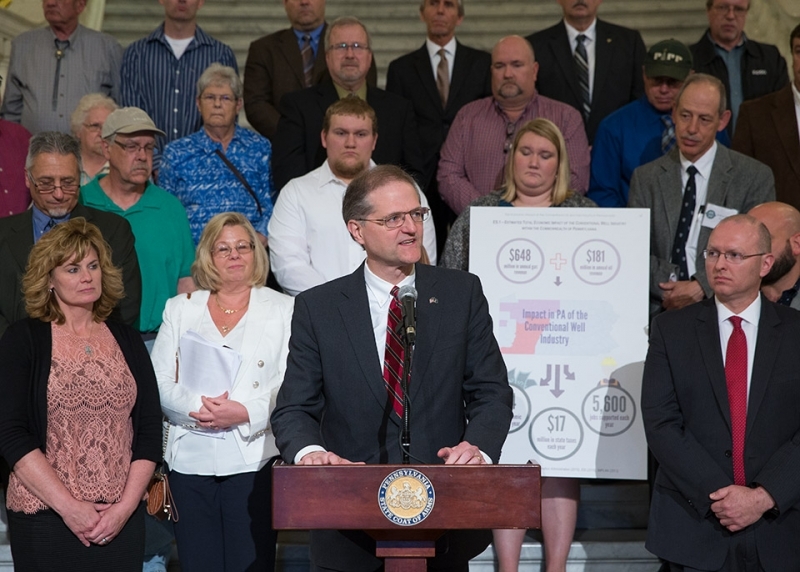 May 9, 2017 – Senator Hutchinson speaks at a rally in support of PGCC (Pennsylvania Grade Crude Oil Coalition) and PIPP (Pennsylvania Industry of Petroleum Producers) and a recent impact study released detailing the industry’s positive affect on Pennsylvania’s economy. 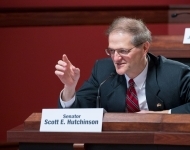 May 9, 2017 – Senator Hutchinson questions Patrick McDonnell during a Senate Environmental Resources & Energy Committee hearing considering his nomination as Secretary of the Department of Environmental Protection. 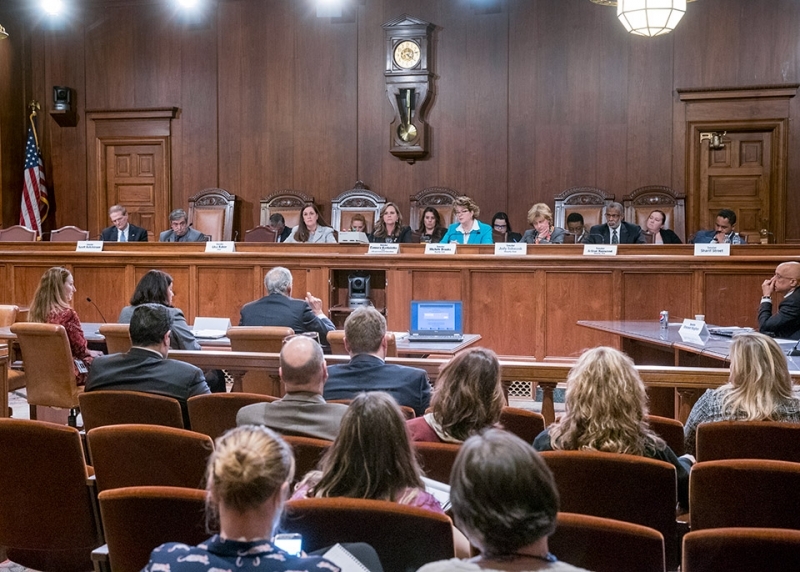 Members heard testimony from the nominee regarding his views on environmental issues and plan for the Department going forward. 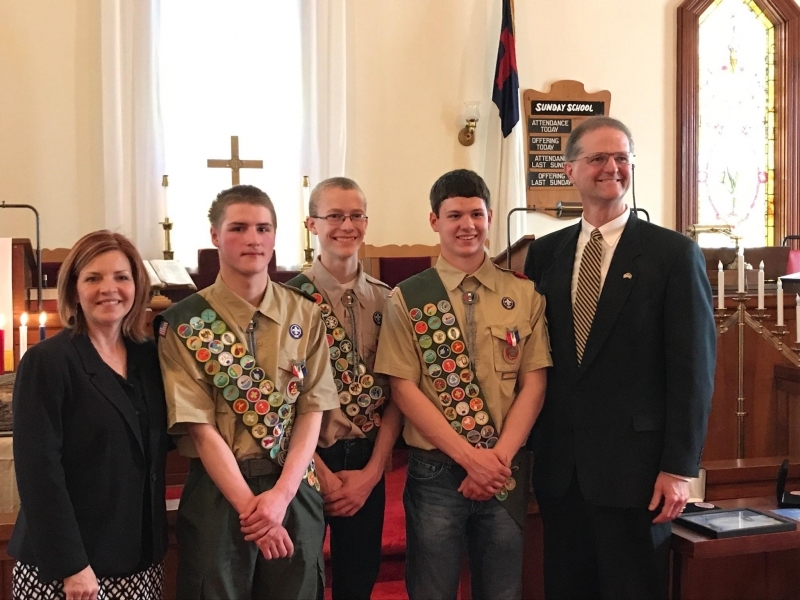 April 23, 2017 – Senator Hutchinson attended the Eagle Scout Ceremony of constituents Thomas Cochran, Daniel Parrett and Luke Cussins. 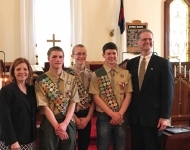 For Thomas’ Eagle Scout Project he erected a new sign at the Frostown Cemetery and placed new landscaping around the base. 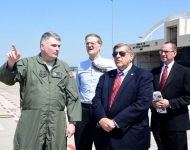 He also straightened old tombstones and removed debris from the cemetery. For Daniel’s Eagle Scout Project he placed a memorial bench in the center of Marienville to honor fallen firefighters and others who serve the community. 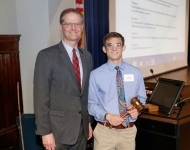 For Luke’s Eagle Scout Project he worked on revitalizing the Sojourn Interpretive Trail, which included cleaning the trail, adding a footbridge, building benches along the path and painting and replacing signs. 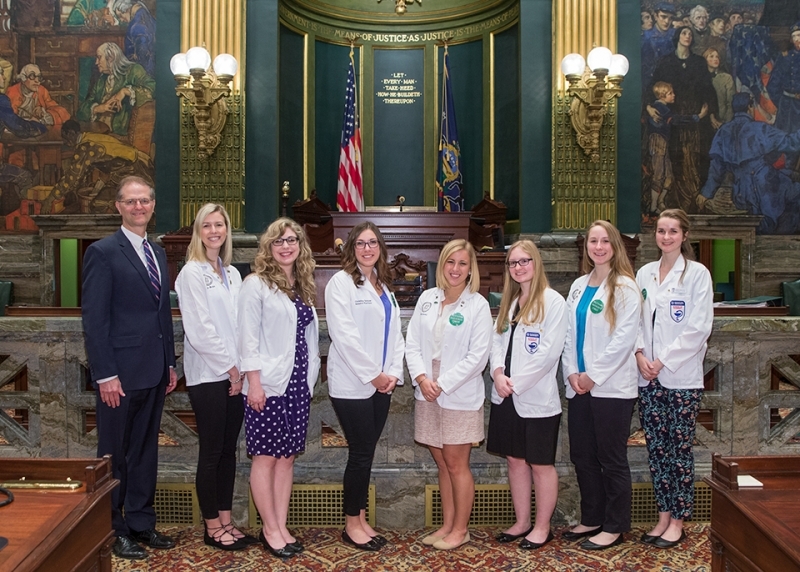 April 19, 2017 – Senator Hutchinson met with pharmacy students from his district during this year’s annual Pharmacy Legislative Day. 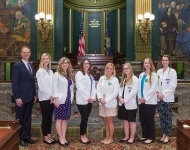 During their meeting they discussed various topics including pharmacy technician registration and vaccination legislation. 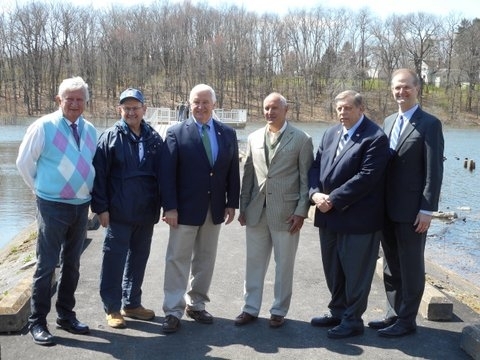 April 12, 2017 – Senator Hutchinson attends a ribbon cutting ceremony to mark the completion of the Glade Run Lake Damn project. 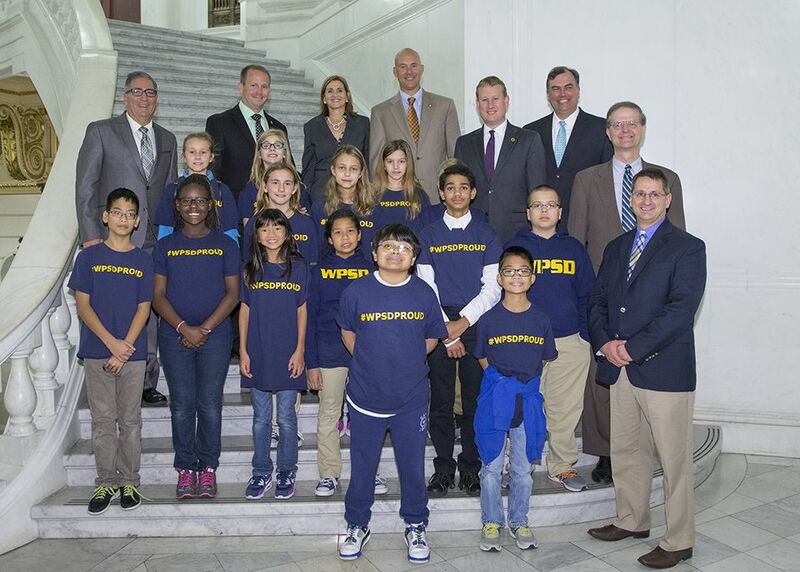 This project included the reconstruction of the dam’s concrete spillway and the reinforcement of the embankments. 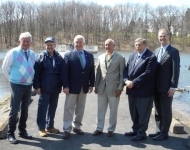 Pictured with Senator Hutchinson are Senator Don White, Senator Randy Vulakovich, Governor Tom Corbett, Siggy Pehel, President of the Glade Run Lake Conservancy, and John Arway, Executive Director of the Fish and Boat Commission. 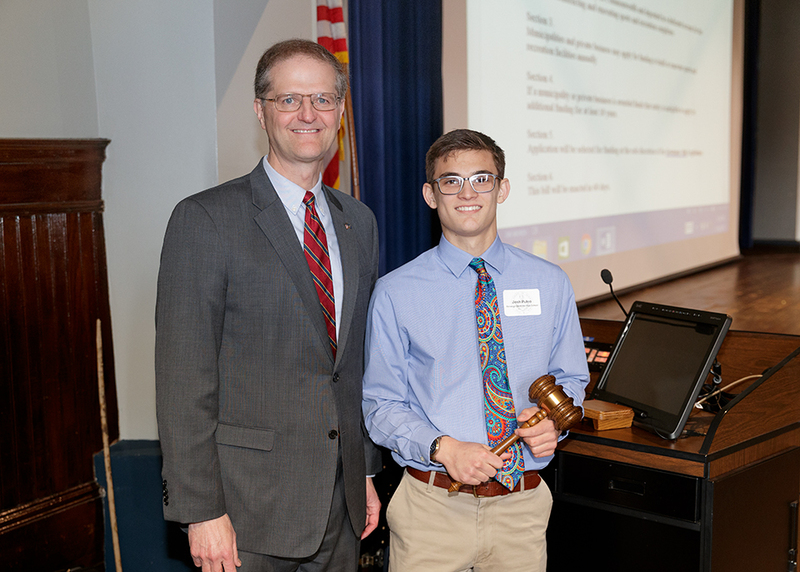 April 4, 2017 – Senator Hutchinson met with constituent Jarod Peterson, a 6th grade student at Beaty-Warren Middle School. 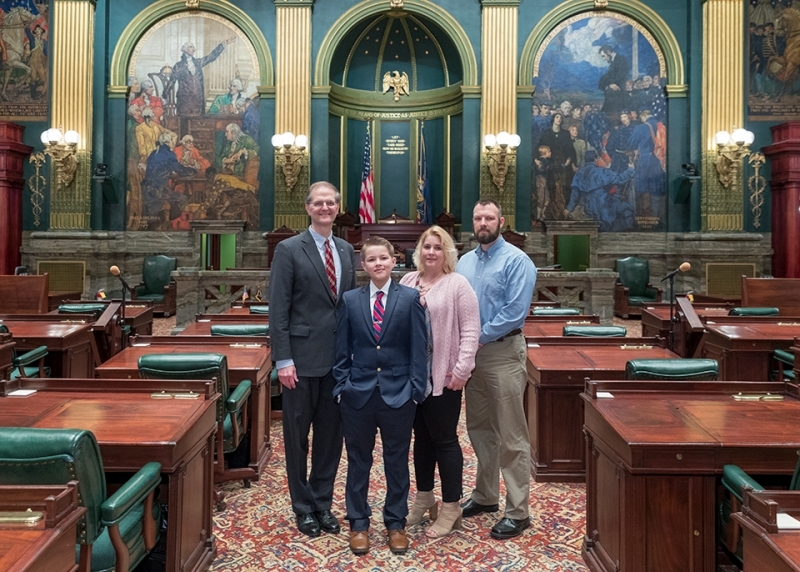 Jarod is the son of Nicole & Brad Peterson who are also pictured. 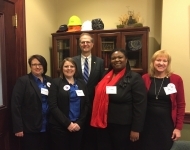 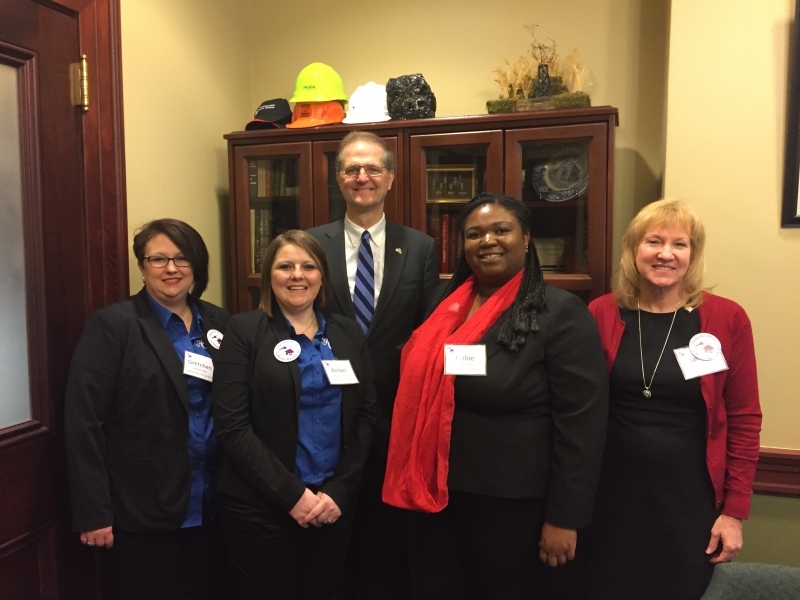 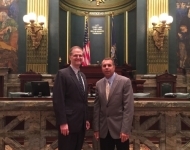 April 4, 2017 – Senator Hutchinson met with local school officials from his district during their recent trip to Harrisburg. 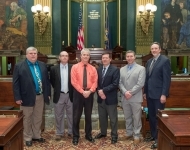 Pictured are Mike Stahlman, Superintendent of Clarion Area School District; David McDeavitt, Superintendent of Allegheny-Clarion Valley School District; Wayde Killmeyer, Executive Director of the Midwestern Intermediate Unit 4; Pat Gavin, Superintendent of Oil City School District, Jeff Clark; and Jeff Brown, Executive Director of Riverview Intermediate Unit 6. 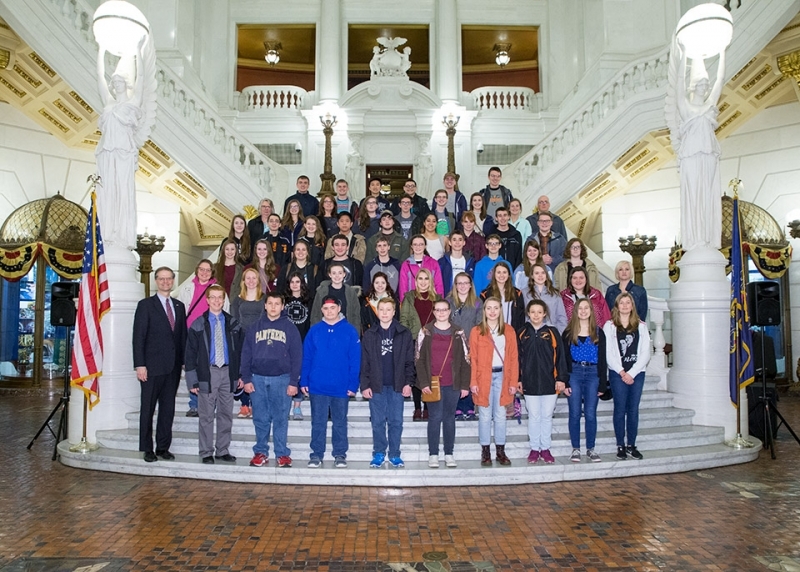 March 31, 2017 – Senator Hutchinson met with students from Clarion High School during their recent trip to the Capitol. 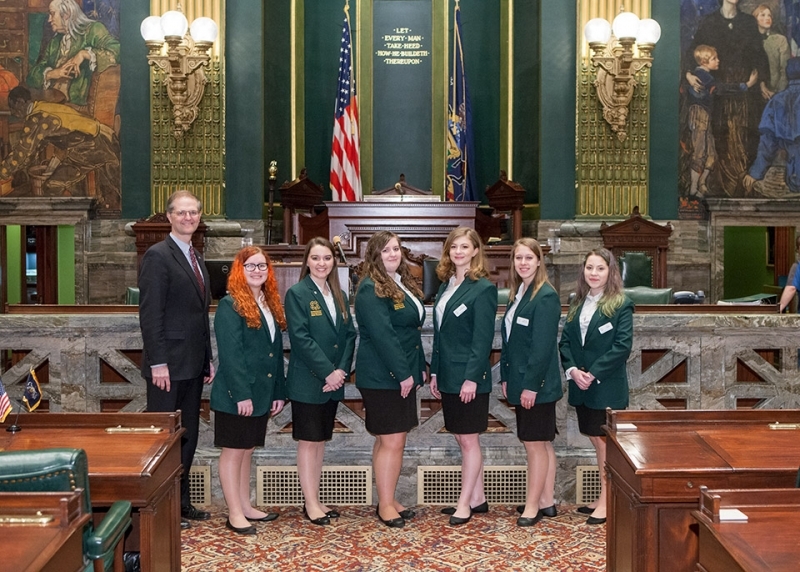 March 31, 2017 – Senator Hutchinson met with 4-H members from his district during their recent to Harrisburg. 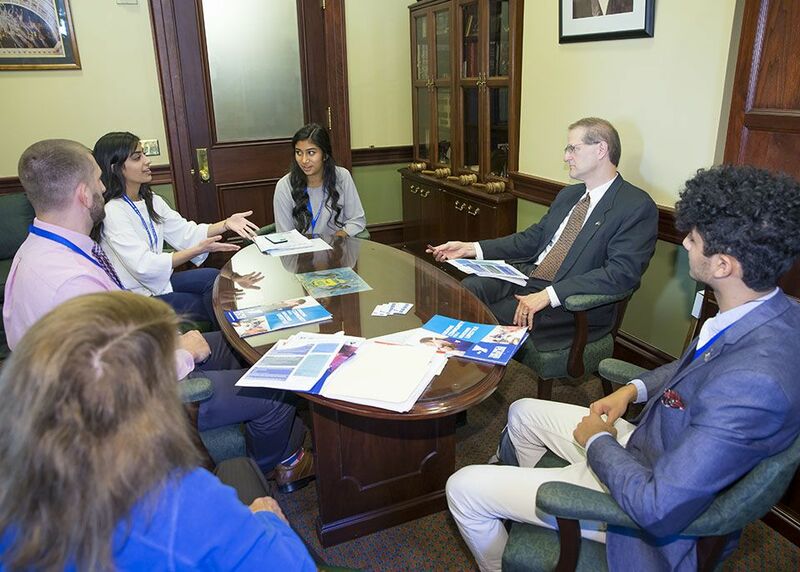 The students also met with the Secretary of Agriculture, Russell Redding, to discuss various agricultural topics. 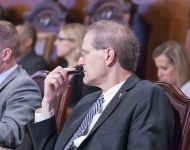 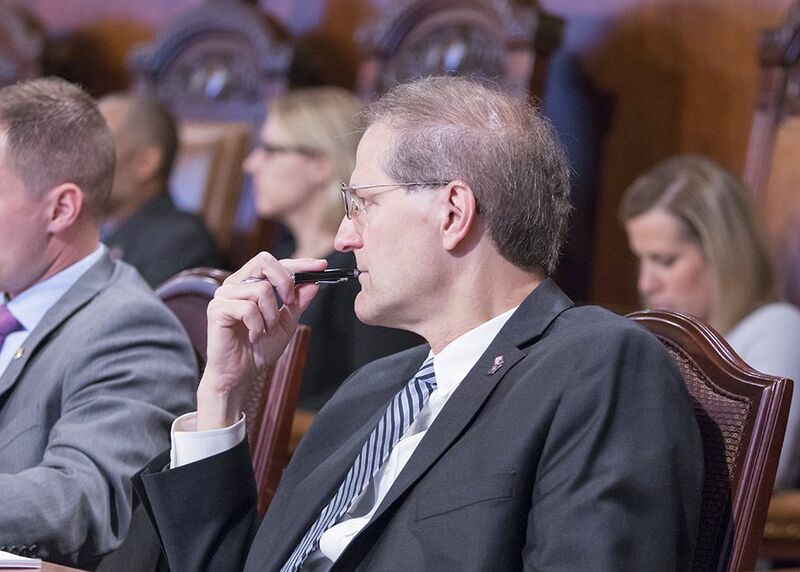 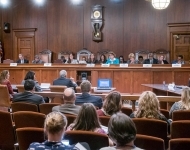 March 29, 2017 – Senator Hutchinson reviews testimony during a recent joint Senate hearing on Governor Wolf’s proposed consolidation of the Department of Health and Human Services. 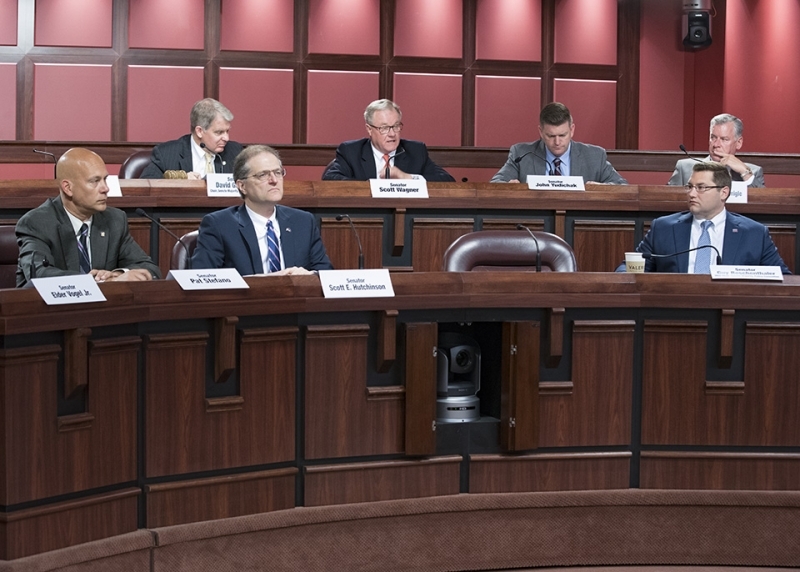 March 29, 2017 – Senator Hutchinson listens to testimony during a joint Senate Veterans Affairs and Emergency Preparedness and Senate Labor and Industry Committee hearing on the State Workers Insurance Fund and the impact of the Cancer Presumption Act. 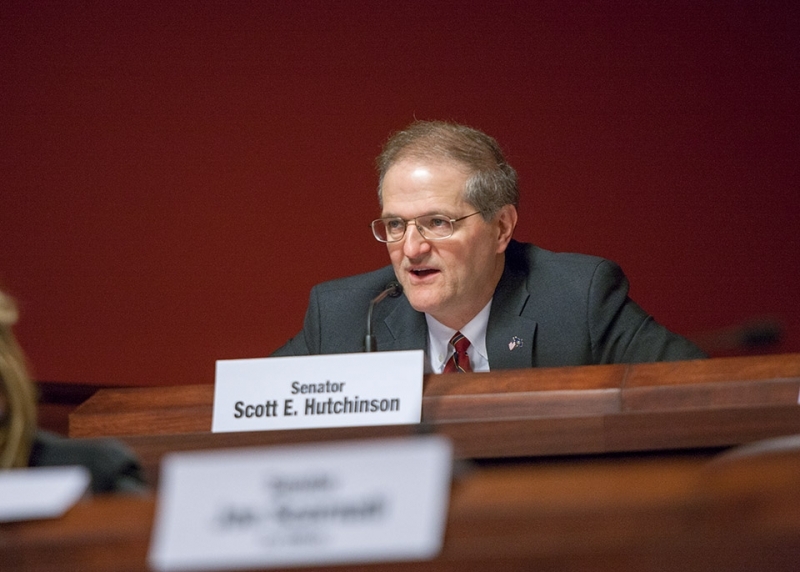 March 28, 2017 – Senator Hutchinson questions a speaker during a Senate Local Government Committee meeting. 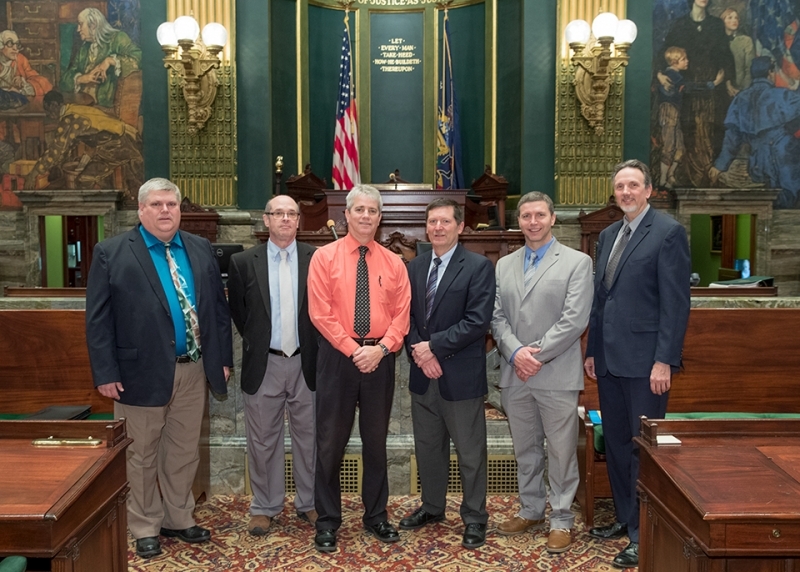 March 27, 2017 - Senator Hutchinson presented a Senate Citation to Bill Lynam (center) of Seneca during a recent ceremony honoring him for his 50 years of service as a Hunting Education Instructor for the Pennsylvania Game Commission. 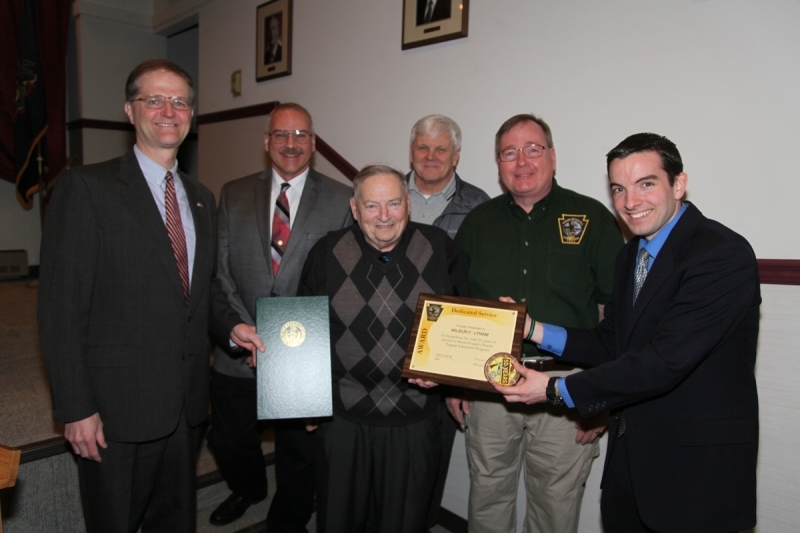 Also pictured (from right) are Andrew Heuser, PGC Hunter Education Division; Jim Daley, Region 1 PGC Commissioner; Len Hribar, retired Venango County Wildlife Conservation Officer; Regis Senko, Northwest PGC Spokesman. 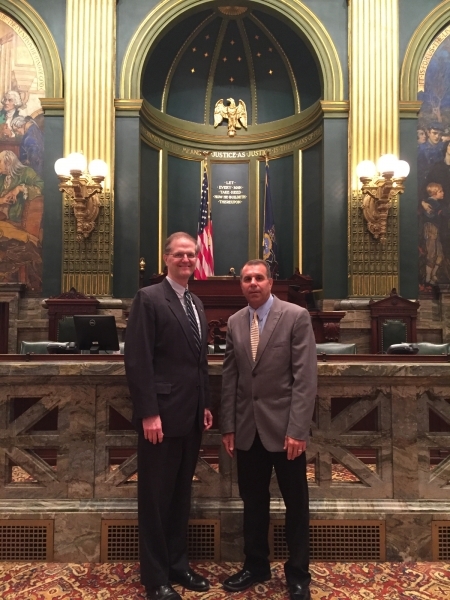 March 21, 2017 – Senator Hutchinson met with constituent and Adams Township Supervisor Russell Ford to discuss the progress of a new Fire Headquarters Building that is being built in Adams Township. 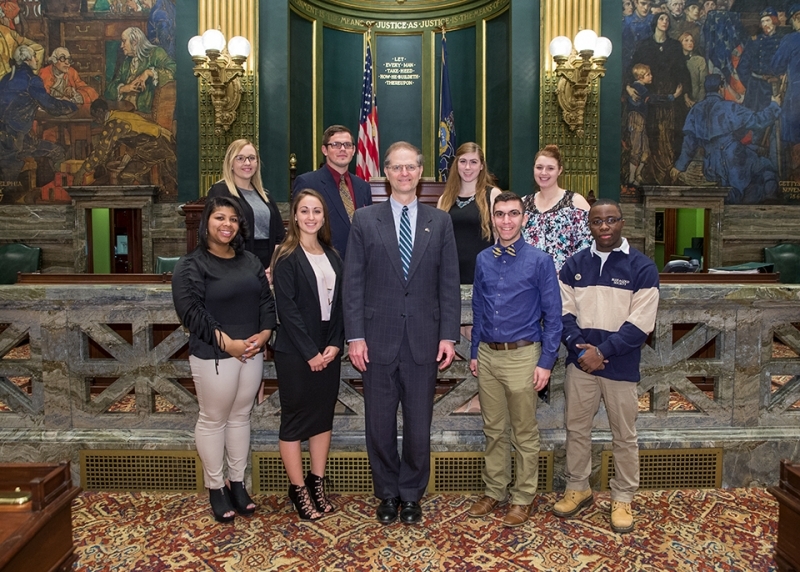 March 21, 2017 – Senator Hutchinson met with students from the University of Pittsburgh during their annual Pitt Day event. 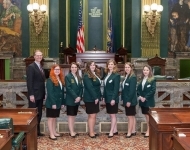 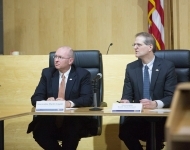 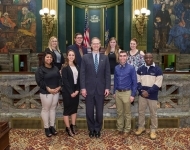 They discussed various topics dealing with higher education in Pennsylvania. 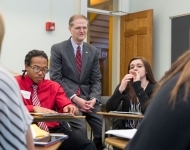 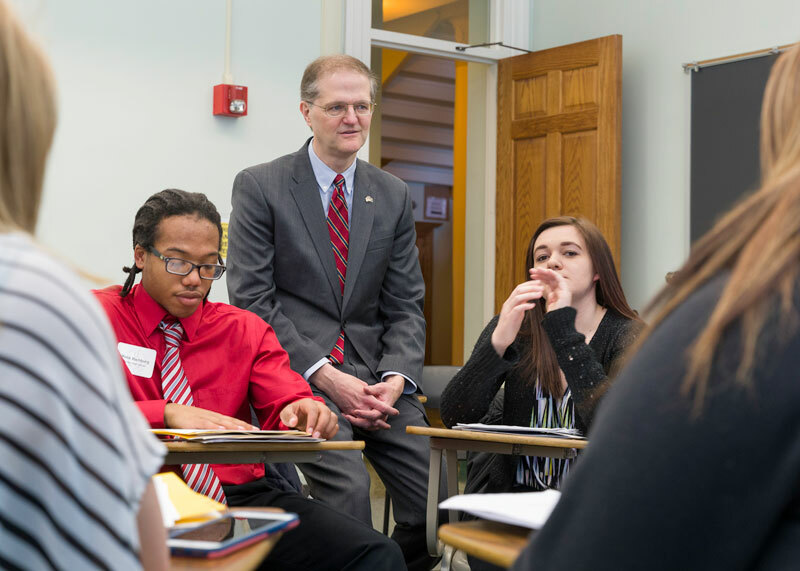 March 16, 2017 - Senator Scott Hutchinson discusses the legislative process with students from around the 21st Senatorial District during his Student Government Seminar held March 16 at Clarion University. 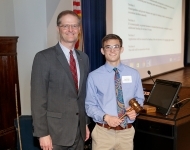 March 16, 2017 - Senator Scott Hutchinson recognizes Josh Puleo, a student at Venango Catholic High School, for his service as Senate President during his Student Government Seminar. 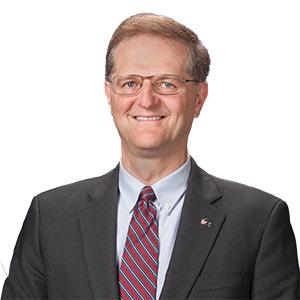 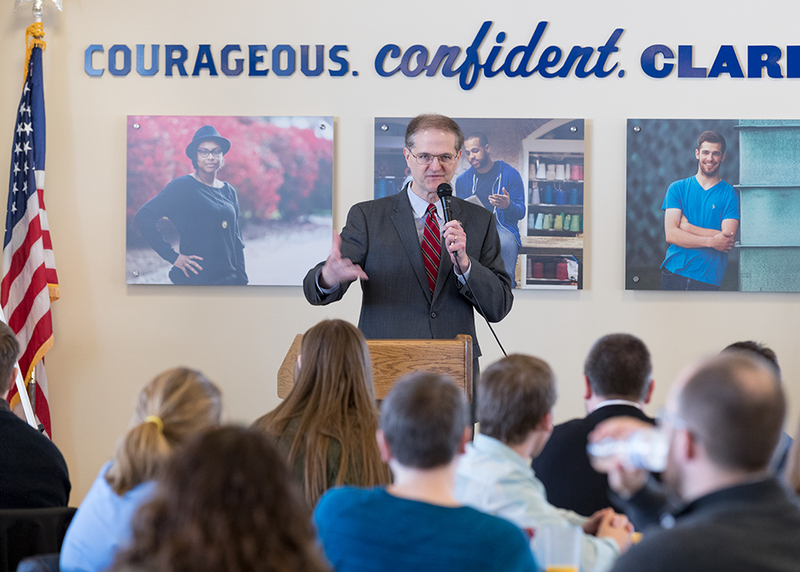 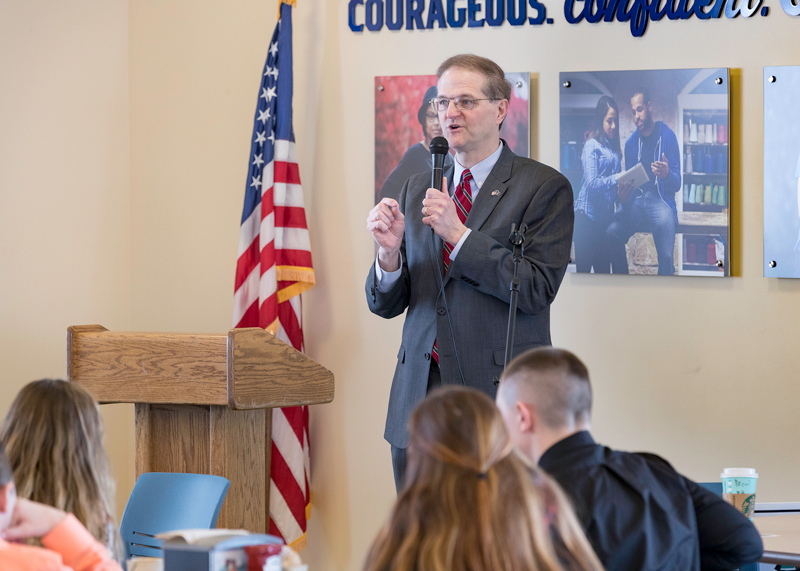 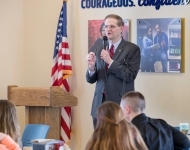 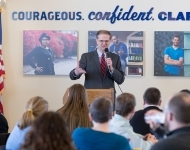 March 16, 2017 – Senator Scott Hutchinson discussed the legislative process with students from around the 21st Senatorial District during his Student Government Seminar held March 16 at Clarion University. 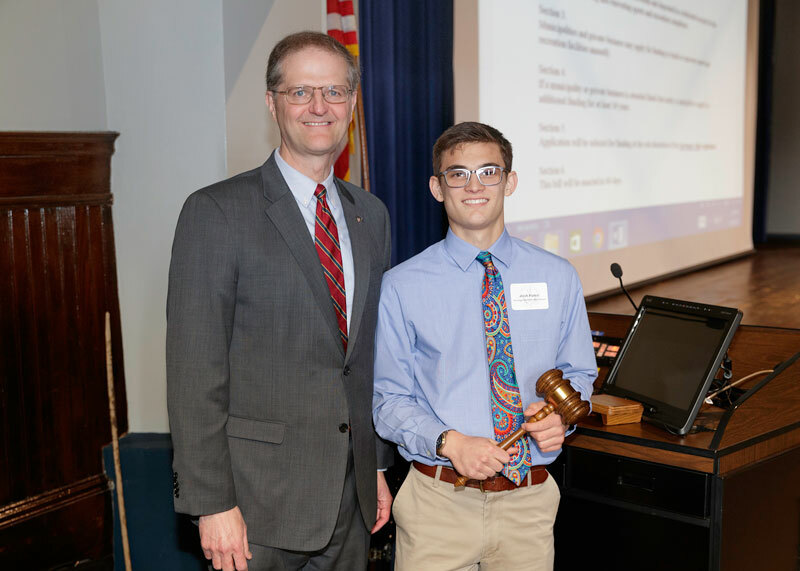 March 16, 2017 - Senator Scott Hutchinson recognized Josh Puleo, a student at Venango Catholic High School, for his service as Senate President during his Student Government Seminar. 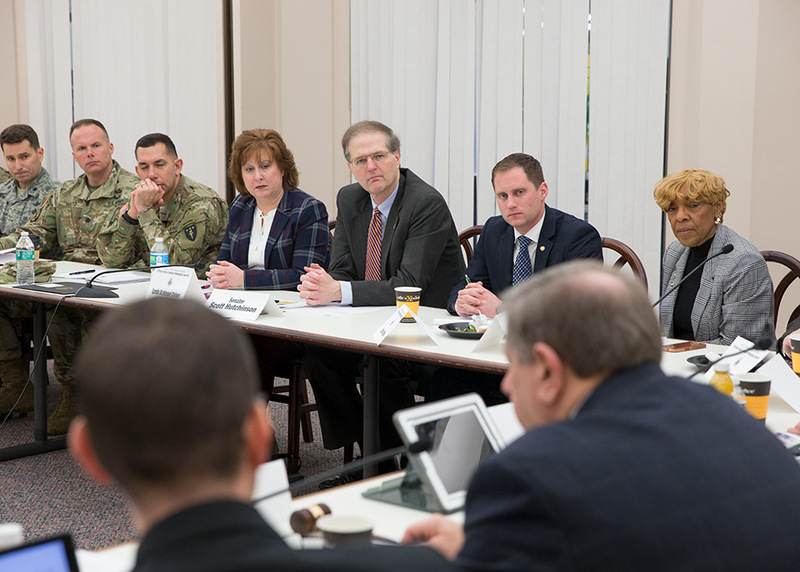 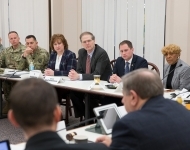 March 7, 2017 - Senator Hutchinson recently participated in a roundtable discussion with students, faculty and veterans from the Army and Army War College to discuss the state of the college and the academic outlook for various programs. 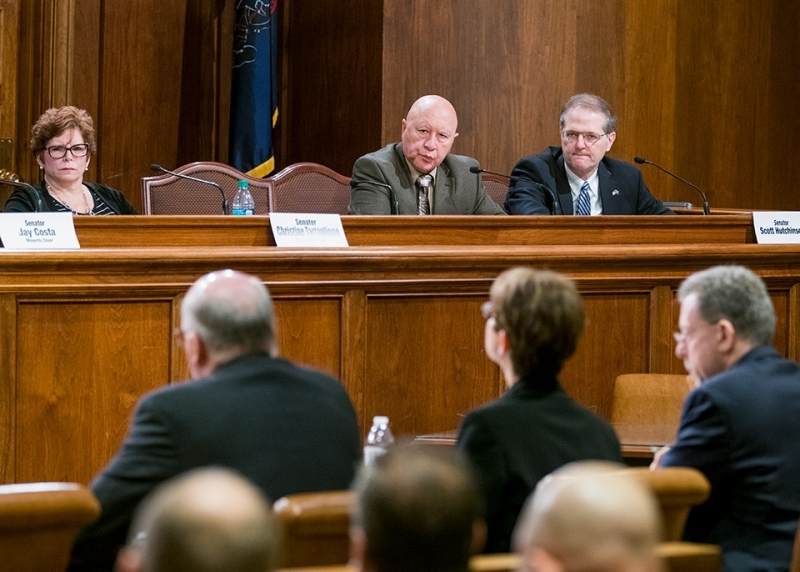 February 21, 2017 – Senator Hutchinson attended the inaugural meeting of the Pennsylvania Grade Crude Development Advisory Council as one of the members appointed by Senator Pro Tempore Joe Scarnati. 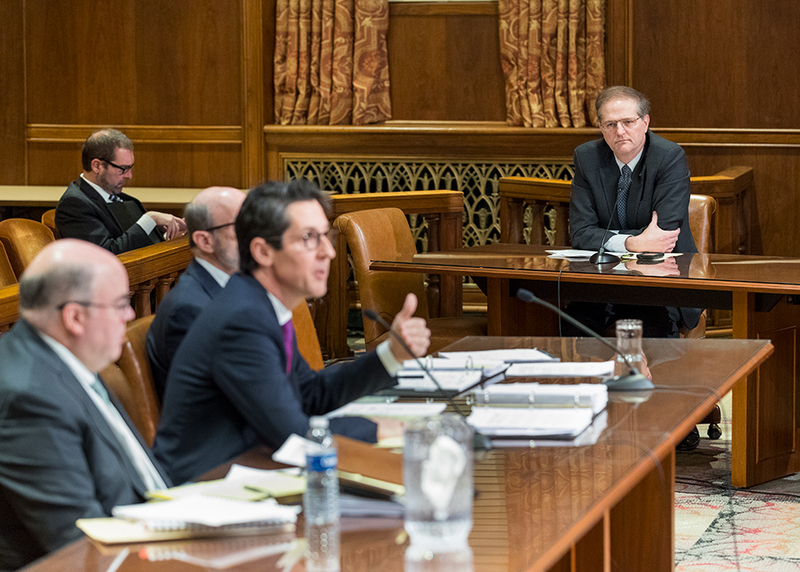 The Council will be charged with helping to grow and develop the conventional oil and gas industry throughout Pennsylvania. 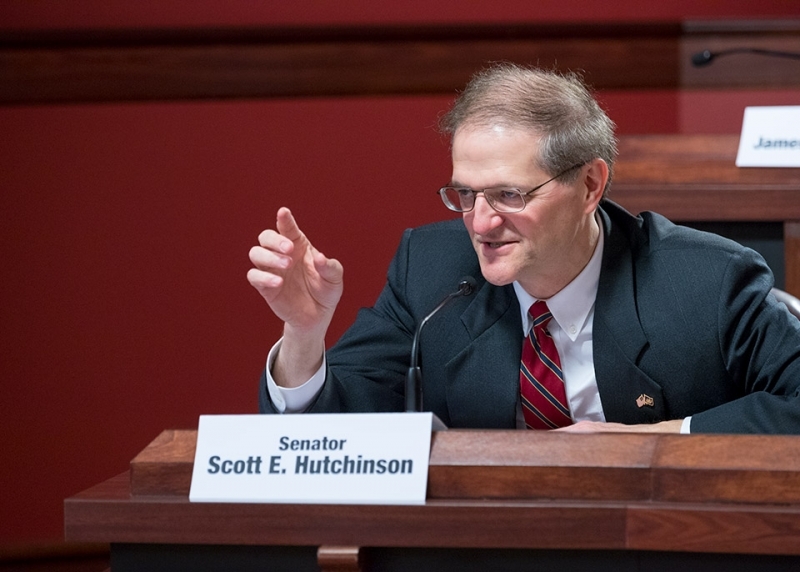 February 21, 2017 – Senator Hutchinson attended the budget hearing for the Auditor General, Lottery and Treasury where he heard testimony from various department officials. Pictured is the Treasury Secretary giving testimony to the Senate Appropriations Committee and other Senators. 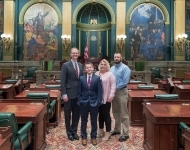 January 3, 2017 - Senator Scott Hutchinson (center) swears his oath of office to become the State Senator representing the 21st Senatorial District.